The beautiful city of Amsterdam is home to some of the world’s most famous and best reputed seed companies who have made an art of new genetics and cannabis seeds. One of their genetic artists is Henk van Dalen. Henk is the owner of the Dutch Passion seed company since its start in 1987 in Amsterdam. Dutch Passion already employs a number of breeders who are constantly working on improving the quality of their weed seeds. They also try to increase the user friendliness by making the cannabis seeds easier to grow. A beautiful example of their accomplishments is the Trance. The Purple #1 unites the best of two worlds. There is a reason that the cannabis seeds of this species are so famous, and that reason is not only its striking purple colour as a result of the cultivation. Purple #1 by Dutch Passion is a crossing of 50 percent sativa with a purple Afghan that is responsible for the 50 percent indica. Since the nineteen-eighties, the Passion #1 is cultivated in the Netherlands. This type has found its way from California. Passion #1 is a plant by Dutch Passion that is known for the exceptional size it can grown into. Dutch Passion lives up to its name with this reliable species: get acquainted with the cannabis seeds of Hollands Hope! The plant is ideal for the outdoor grower who is dealing with the Dutch climate because this extremely powerful indica is completely resistant to it. The beautiful city of Amsterdam is home to some of the world’s most famous and best reputed seed companies who have made an art of new genetics and cannabis seeds. One of their genetic artists is Henk van Dalen. Henk is the owner of the Dutch Passion seed company since its start in 1987 in Amsterdam. But already long before that, in 1972, Henk started growing cannabis to provide in his own needs. He also studied biology at the Amsterdam university. After graduation he continued to study pharmacology and more specific the effects of psychedelics and other drugs. By the time he left university, Henk was well known among cannabis breeders. Henk started experimenting with cannabis seeds found from imported Thai and Nigerian cannabis which he cross-fertilized with other species that he came across through his network. He managed to build a reputation with these experiments because the resulting quality of his cannabis, grown from his experimental seeds, turned out to be much superior than the quality of cannabis imported from Asia, Africa or other parts of the world. At the beginning of the 80ies Henk decided to make his genetics available to other breeders but still on a very small scale. Passion #1 (a.k.a. Amstel gold back in those days) is a typical example of the result and power of his early species. These could easily stand up to the best hashish of that moment like Chitral or Pakistani. Slowly came the idea that there is no absolute need to import good cannabis. Together with other breeders, Hank established the possibility for anyone to grow good quality cannabis provided you had the right cannabis seeds. This cannabis was very often better compared to imported cannabis from traditional cannabis producing and exporting countries. So Henk laid out a simple philosophy: to keep his passion alive and aim for an offer of the highest quality cannabis seeds. Today, still, this philosophy makes the core of the Dutch Passion seed company. In 1988 Hank started his coffee shop “Homegrown Fantasy” where he only sold Dutch grown cannabis. His original Haze/Skunk won the High Times coffee shop trophy and he steadily built on his reputation. 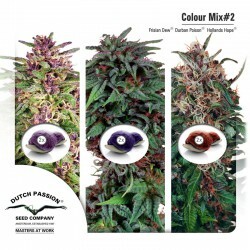 In the early 90ies Dutch Passion was involved in the birth of feminized cannabis seeds. What seemed like just a good idea at first turned out to reality later on. Using Henk’s biology background Dutch Passion managed to produce feminized seeds – cannabis seeds that guarantee the growth of female plants. Nowadays the majority of cannabis seeds on offer are feminized seeds. Further refinement in this technique has yielded more reliable and stable seeds. About a third of Dutch Passion’s offerings are high quality regular cannabis seeds for those aiming at their own seeds or at cross-fertilization based on solid genetics. 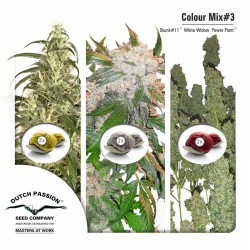 Over the last years Dutch Passion has also invested heavily in autoflowering cannabis seeds. New autofem varieties have delivered excellent results with indoor, outdoor and greenhouse growing techniques. Further refinement of Autoflowering species is ongoing so Dutch Passion expects to improve its current range of autofem seeds in the future. Dutch Passion also believes that cannabis can have a real medicinal effect. Species like Ortega Indica have already shown to really suit medicinal cannabis growers. Co-operation with the CBD crew back in 2012 has given Dutch Passion the opportunity to successfully develop high level CBD varieties. 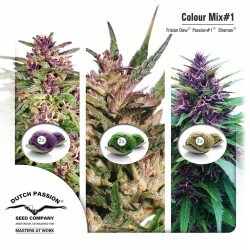 Dutch Passion’s range will offer old classics next to recent innovations and newly developed cultivars.